Is it wrong to be in love with a knife? Will people laugh at our love? Will I be labeled some sort of weirdo cutleryophile? 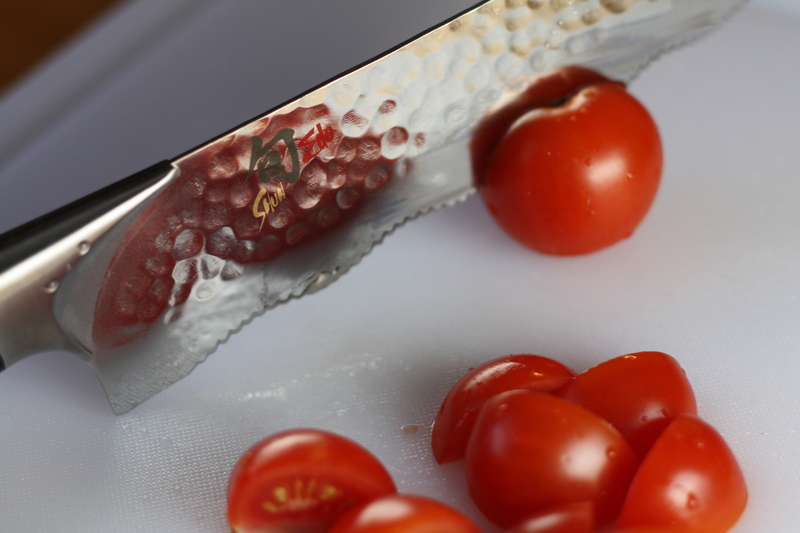 Call me what you may…I am madly in love with a knife. It was true love at first sight. I initially spotted my new darling in the window at a Chicago Williams-Sonoma. I was drawn to that knife in the way which other women are drawn to the glittery diamonds on display in a jewelry store window. My heart went pitter-patter. The noticeable blush in my cheeks sent a surge of jealously through my husband. 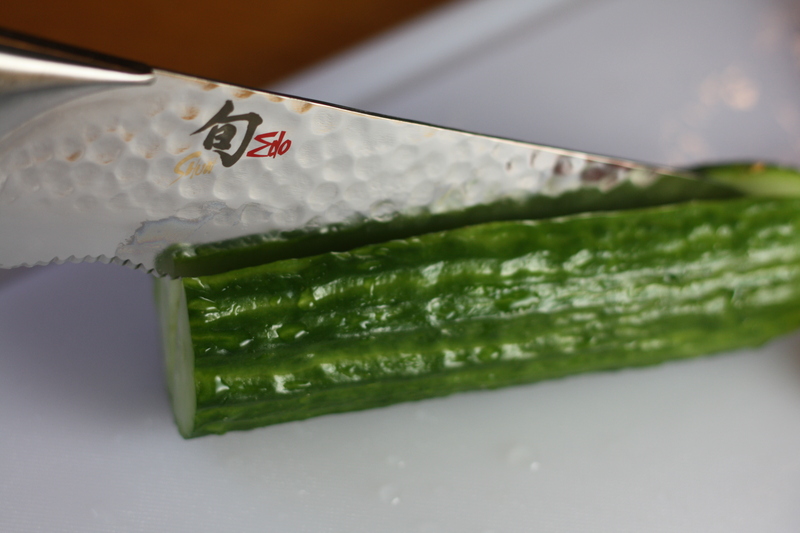 The object of my affection was a knife in Shun’s newest Edo line of knives, sold exclusively at Williams-Sonoma. Gorgeous hammered steel detailing, samurai sword sharpness, perfectly balanced weight; not only a precision cutting tool, but a beautiful work of art. The 8″ Dual-Density Utility knife, with its high and low frequency serrations, whispered sweet nothings at me through the window. I was so easily wooed; so fully enamored. Were it not for its mind-numbing price tag and the knowledge that airport security would never have allowed me to gingerly carry my new love on board, I would have purchased that knife on the spot. Alas, I left empty-handed with a razor-sharp hole in my heart and the salty remnant of a single tear run down my cheek. Then, this past weekend, we paid a visit to my parents to celebrate a belated Christmas. And Santa had left a very special gift for me at my parents’ house; the knife of my culinary dreams. Though I’ve been a loyal fan of the very excellent Henckels and Wüsthof knives for many years now, I have to admit that this knife puts my other knives to shame. My other knives quivered in the knife block when they saw this one coming. I can still hear them crying their nervous tears that they may never be used again. Today’s recipe was selected for the pure excuse of having something to cut with my new knife; so simple, it’s barely a recipe at all. 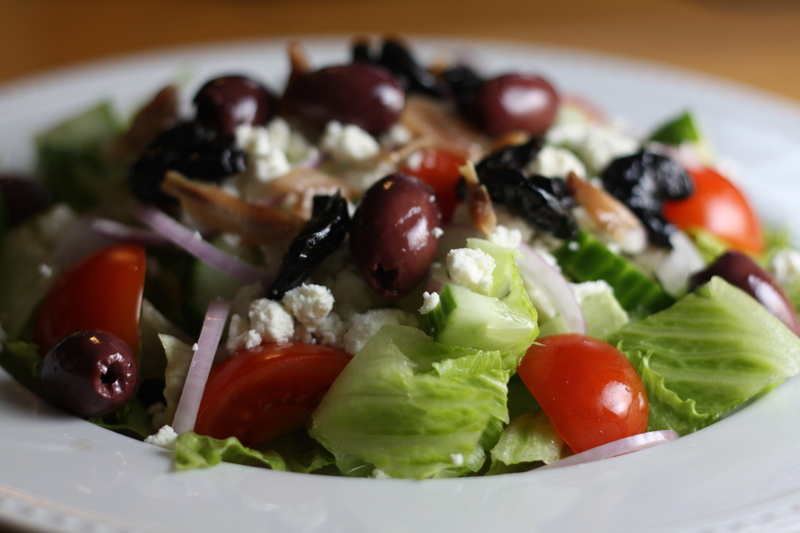 The bonus is that it also happens to make a delicious, refreshing, and flavor-packed meal; a fresh Greek salad decked with feta cheese crumbles, savory olives, and a basic red wine vinaigrette. I threw a few chopped anchovies onto my salad, but if the tiny, salty fish aren’t your cup of tea, simply omit them. A skewer of grilled shrimp or a nice piece of broiled fish would make other excellent additions. Combine all vinaigrette ingredients and whisk to combine. Toss the lettuce, tomatoes, cucumbers, and onions in a bit of the dressing. 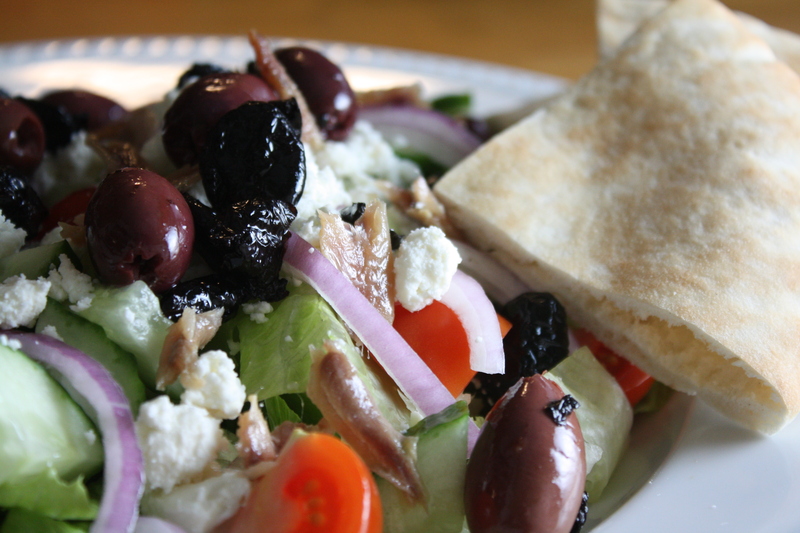 Top with feta cheese, olives, and anchovies (optional). Serve with toasted pita triangles, if desired. Posted in Cheese, Dressings and Condiments, Food, Main Course, Recipes, Salads, Side Dishes, Things I Love, Vegetable and tagged cheese, Cooking, Food, food photography, life, love, Recipes, salad, vegetables. Bookmark the permalink. Oh yes, I have knife envy! 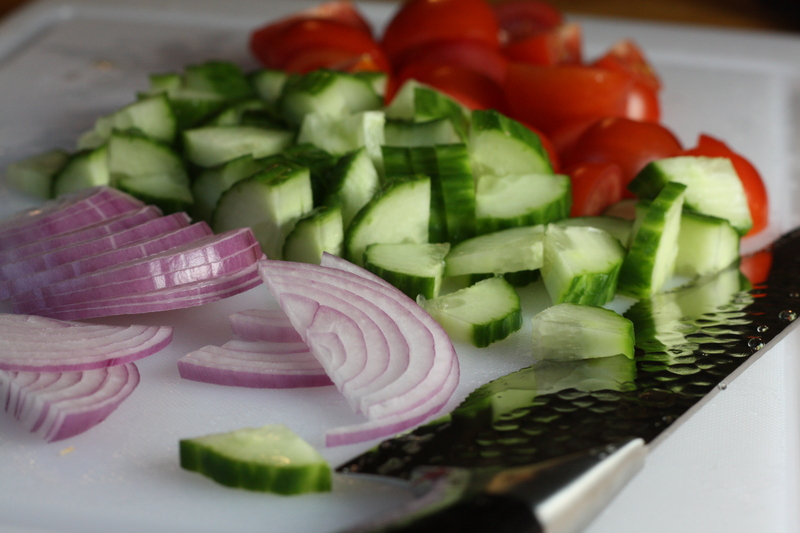 I love the feel of a well balanced knife in my hand as I slice through crunchy veggies. Enjoy! LITERALLY laughing out loud (in public at a local cafe!). You should totally copyright “cutleryophile” before some knife company steals your term! LOL! p.s… the salad looks GREAT! What a love story..so touching!!! LOL! Salad looks wonderful and tasty..stunning photo of your love!!! I have bizarre feelings for my kitchen appliances and utensils, too…. I love them! I got an immersion blender and a digital food scale for Christmas, and I was SO excited LOL.